Every now and then, we will attempt to write the worst sports column on earth. 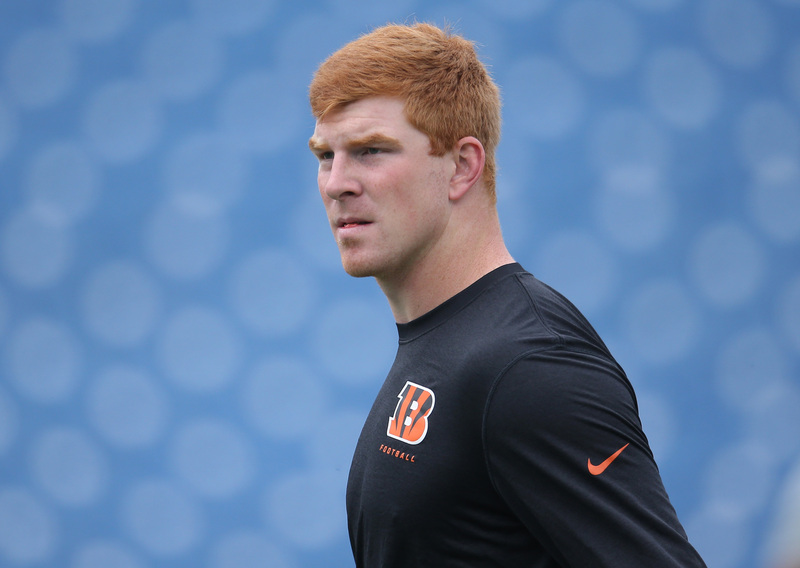 Today: Let’s talk about Andy Dalton and redemption. CINCINNATI — It’s not easy. Day after day, it’s hard to put your head down and do your job, no questions asked. And to me, it’s telling that the true talent of a guy like Andy Dalton got lost this week. On Monday morning, Dalton signed a six-year deal that could be worth as much $115 million. Almost immediately, he became a punch line all over America. Nobody was expecting a deal before the season, and nobody was expecting that many zeros in the press release. It sounds like a ton of money. It is a ton of money. With that kind of cheese, you could make a pizza the size of Ohio. Was it crazy? It’s a good question. A lot of Internet brain surgeons have different ways to dissect all this, but not everybody’s patient, so let’s get to the heart of the matter. Andy Dalton understands how to play the quarterback position. He won’t be your best player, but he’ll put your best players in a position to succeed. He’s not flashy, he won’t dominate SportsCenter, and he won’t lead the league in touchdowns. He won’t star in a dozen new commercials every year. I guess you could say he — gasp — just plays quarterback. It’s a novel concept, I know. But maybe that kind of player is more valuable to a football team than the superstar who spends the offseason filming documentaries and commercials and then gets hurt trying to scramble his way to glory. To understand the Bengals’ decision, consider the alternatives. Would you rather break the bank to pay someone like Cam Newton? Newton’s due for a big payday, himself. He came into the league the same time as Dalton, and he’s put up bigger numbers every step of the way. He has his trademark end zone dance, a shoe deal, and commercials to last the whole year. But he’s also missed the playoffs two of three seasons. Dalton may not be a home run hitter like Cam, but he’s batting 3-for-3 when it comes to leading a team to the playoffs. Which guy do you want in your dugout? Would you rather sign some washout replacement like Matt Schaub or Mark Sanchez? Don’t answer that — I’ve got Michael Vick on line one, wondering why he wasn’t included in the question. Would you rather the Bengals had drafted Johnny Manziel this spring and groomed him to take over? Look, I won’t deny Manziel has talent. And a lot of teams think it’s smart to replace a pricey veteran with a talented rookie. But we’re talking about the quarterback position. This is the face of your franchise. The example setter. The leader. Johnny Goofball is the “leader” who comes with a truckload of baggage and, behind that, a truck full of reporters. Do you really want to bet the farm on a golden goose who might get drunk and lay an egg? It’s already a jungle out there with this league. Nobody wants to see their locker room turn into a zoo. If I’m the Bengals, I pay the tiger I know. Let the other teams deal with the monkey business. Look, I know athletes are grossly overpaid in this country. It’s … well, it’s gross. When you think of the teachers scraping by, the auto mechanic wiping sweat off his brow every day, it’s hard to justify the athlete paychecks that go to a new Bentley every month. I understand why folks get upset. But I wasn’t upset Monday. If Andy Dalton were partying all summer and showing up with a new tattoo every day and filming commercials between every practice, would he still get paid? Of course not. But that’s not what Andy Dalton did. That’s why he got paid. The NFL doesn’t need any more jackwagons. It’s the guys like Dalton who hit the jackpot. It’s a message to the rest of us. Hard work may be a lost art in this country, but that doesn’t mean all the artists are starving. Joe Flacco and Andy Dalton are proof. Just putting your head down and going to work like a true professional won’t always make you a star, but if you show up long enough, there just may be a pot of a gold at the end of that rainbow. Professionalism is a skill, too. Teams learn to count on you, and they pay a premium for a guy they can trust. Call it the “true pro” tax. Or the Dalton double-down. That’s what we saw Monday. The Bengals didn’t draft some punk rookie or bet big on a burnout veteran. They trusted the tiger they knew. And just like that, none of the old jokes mattered. All the loudmouth critics were irrelevant. Everyone who ever called him overrated was wiping egg off their face while eating crow and washing it down with a little humble pie. This week, a regular ol’ guy who plays quarterback for the Cincinnati Bengals gave hope to regular ol’ guys everywhere. Some people call him Red, other people call him Andy, then the Bengals called him and locked him up for $100 million. And I call that redemption.